I have never really embraced true winter boots as part of my day to day wardrobe, but after the last J.Crew catalog, I had a change of heart. Yesterday was the beginning of the snowy season here in Utah & I suddenly found myself looking for an affordable winter boot I could mix into my wardrobe. I bought a similar coat to this last week, & I can't wait to give this look a try. Target is definitely the place to look for winter boots with a J.Crew feel for under $50. Here are my favorite options. So, far I am really happy with the boots I bought & hope I mix them into my wardrobe half as creatively as the J.Crew models. 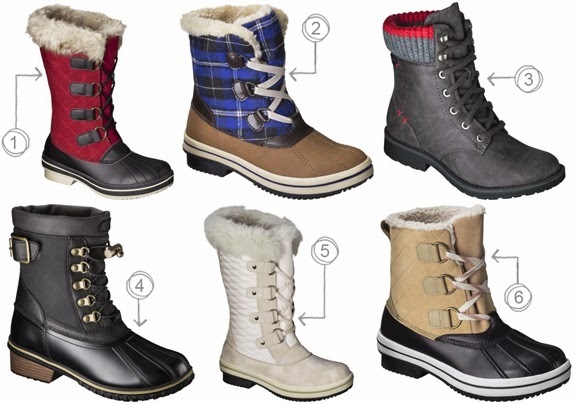 Do you have a pair of winter boots you are happy to mix with your day to day clothes? These are good picks! I was actually looking at the same j crew boots thinking that I would get a lot of wear out of them here in Alaska. I have a pair of sorel boots that I wear pretty much everyday here. this couldn't come at a better time. we just moved back to utah as well and this week has really shown me how useless my stash of shoes will be in this kind of weather. thanks!